Jamie Whincup admits that help from team-mate Shane van Gisbergen wasn't his only touch of good fortune on the way to a record breaking victory at the Red Rooster Sydney SuperSprint. The six-time champion almost threw away his chance at a 106th career victory when he locked his left-front at turn 2 at the start of his final stint. 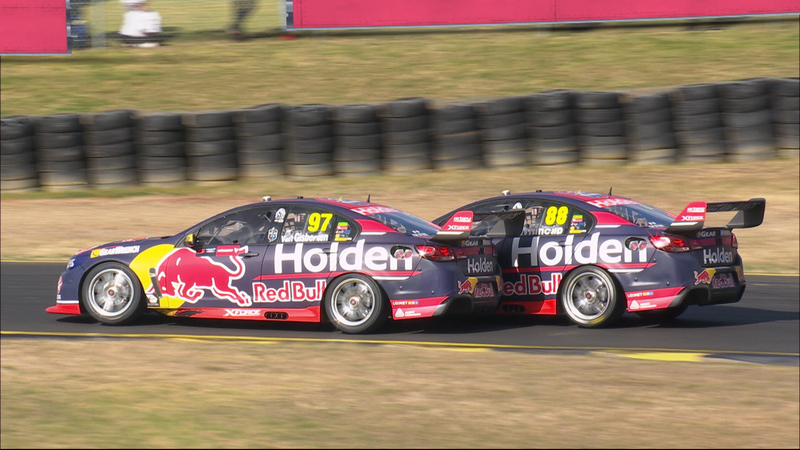 Whincup had rejoined narrowly ahead of van Gisbergen, who snuck through to the lead as the #88 Commodore ran wide. With no apparent damage to the tyre, Whincup quickly recovered to hound his team-mate while fourth and fifth placed Fabian Coulthard and Chaz Mostert closed them down on fresher rubber. Van Gisbergen finally moved aside with 10 laps to go, allowing Whincup to run away to victory while the Kiwi attempted to fend off the Fords behind. “I had green tyres because I saved a set in qualifying, so I went deep into turn two on a cold, green, tyre,” Whincup recounted. “I locked up and was lucky not to turn it into a fifty-cent piece and it be all over at the first corner. “Our strategy was to work together," he continued when quizzed further on the battle with van Gisbergen. “Ideally we probably would have run longer (in the middle stint) and jumped onto a similar strategy to what Fabs and Chaz were on, then have to pass cars late in the race. “If there was a late Safety Car Fabian and Chaz would have got through and would have had a one-two. Typically, Whincup downplayed the enormity of his 106 race win achievement that sees him pull one clear of long-time team-mate Craig Lowndes. “The number doesn’t mean much, as I always say,” said Whincup. “It’s great to get another win today, wins this year for me have been few and far between, so it's great to grab another one. Van Gisbergen meanwhile finished third after Coulthard slipped through with three laps remaining. “No doubt it hurt to give away a race win, but the team won the race, we got good championship points for both of us and the team, that’s the priority. I’m happy with that,” he said. “The whole race was pretty interesting. Like yesterday, great battles all the way through and at the end there I was hanging on pretty good. “When I let Jamie passed I got on the marbles at turn 2 and my tyres were rooted. “They never really came back and form there I was just slow mid-corner just trying to get a good exit so they couldn’t get me into the next corner.